Howard Hawks’ second sound film, The Criminal Code (based on the play by Pulitzer Prize-winning author Martin Flavin), is long overdue for reconsideration. Cited by Andrew Sarris in 1998 as “perhaps the least known, least accessible, and least frequently revived Hawks talking picture” (1), this prison melodrama has been largely dismissed in the mass of Hawks scholarship that followed Cahiers du Cinéma’s reevaluation of the director’s oeuvre in the 1950s. Not only did the film fail to receive a mention in Robin Wood’s otherwise exemplary 1968 study of Hawks (2), but it also garnered little more than brief, and often disparaging, comments in the subsequent books on the director by Donald C. Willis and Gerald Mast in 1975 and 1982, respectively (3). The film’s detractors have pointed out the stage-bound nature of the production, but it is a far cry from being merely a static “filmed play”. 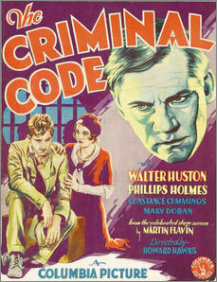 Unlike many of the stage-to-film programmers made during the immediate years of Hollywood’s transition from silent to sound filmmaking, The Criminal Code contains several interesting uses of expressionistic mise en scène and sound, which both underscore the fatalistic world that the film’s prison inmates inhabit and, more importantly in terms of Hawks’ work, illustrate that the director was open to stylistic experimentation before his filmmaking technique, like that of Japanese director Yasujiro Ozu’s decades later, became increasingly minimalist. The film concerns the plight of boyishly naïve Robert Graham (Phillips Holmes), who accidentally kills Parker, the son of an influential figure, at a thinly-veiled speakeasy of the Prohibition era. Stemming from a gin-induced altercation where he tried to protect the honour of a prostitute (Mary Doran), Graham hits Parker over the head with a water bottle due to his mistaken belief that the unarmed man was reaching for a gun. After the boy is arrested, prominent District Attorney Martin Brady (Walter Huston) listens to the eyewitness accounts and believes that the killing was unintentional. Brady goes so far as to brag to a colleague that he could easily get Graham off if he was his defense attorney. However, the politically ambitious Brady asserts that his position as district attorney obligates him to abide by the state’s criminal code, which demands, in his words, “an eye for an eye”. Graham is soon convicted of manslaughter and given a ten-year sentence in the state penitentiary. Six long years pass for Graham. The passage of time is expressed visually with a series of lap dissolves of rows of prisoners marching in unison. This imagery is punctuated with the pulsating rhythm of their footsteps on the soundtrack. Hawks and editor Edward Curtiss’ efficient use of montage in this sequence not only condenses time, but also suggests symbolically the de-individuation that Graham and his fellow prisoners are subjected to behind bars. Their loss of individual freedom and identity spurs them, in the great tradition of the Hawksian male from The Dawn Patrol (1930) onward, to form bonds of solidarity with one another. Rendered frail and embittered from slaving away in the prison’s jute mill, Graham’s emotional and physical deterioration concerns Brady – now the warden of the state penitentiary – who assigns him to be his personal driver. After fellow inmate Runch (Clark Marshall) squeals to the “screws” of a planned prison break – an act of betrayal against the brotherhood that results in the death of Graham’s cellmate Jim Fales (Otto Hoffman) – Graham’s other cellmate Ned Galloway (Boris Karloff) murders the “stoolpigeon” in revenge. Due to his proximity to the body, Graham is sent into the hole until he reveals Runch’s murderer to Brady, who, up until the murder, had been trying to get Graham a pardon. This tragic twist of fate forces both Graham and Brady to re-evaluate their own set of “criminal codes”: the honour among thieves and the state’s laws, respectively. Their ethical dilemmas are further complicated when Brady’s daughter Mary (Constance Cummings) admits to have fallen in love with Graham. Released by Columbia in 1931, The Criminal Code is indicative of, as Todd McCarthy has noted, the decade’s left-wing social reformist movement “keyed to exposing prison conditions and advocating penal reform” (4). This movement flourished in such popular films as The Big House (George Hill, 1930, additional dialogue by Flavin), I Am a Fugitive from a Chain Gang (Mervyn LeRoy, 1932), San Quentin (Lloyd Bacon, 1937), and Each Dawn I Die (William Keighley, 1939). The film’s acclaimed source material and controversial subject matter likely appealed to Columbia’s studio boss Harry Cohn, who was trying to revamp the reputation of his second-tier studio, which had released primarily B-grade programmers with minimal production values in the preceding decade. Unable to lure Hollywood stars to Columbia’s Sunset Gower Studios on “Poverty Row”, Cohn hired noteworthy directors – a list including Hawks, Frank Capra, George Cukor, John Ford, Gregory LaCava, Leo McCarey, Rouben Mamoulian, Lewis Milestone, and Josef von Sternberg – in order to compete with major studios like Metro-Goldwyn-Mayer and Paramount (5). Although widely ignored today, the film received an Oscar nomination for Fred Niblo, Jr. and Seton I. Miller’s screenplay and was a commercial success. Columbia later milked the property for two lesser remakes: Penitentiary (John Brahm, 1938) and Convicted (Henry Levin, 1950). Whereas Hawks brought Columbia added credibility, Columbia gave Hawks creative freedom to experiment stylistically. Hawks underscores the film’s dark themes with creative uses of montage and visual and sound expressionism. This is seen vividly in Galloway’s murder of Runch, which remains amongst Hawks’ most virtuosic scenes. Hawks shows a close-up of the frightened Runch looking out the window of Brady’s office as the prisoners strategically make noises outside to muffle his murder. Runch’s psychological fear is expressed through another montage of lap dissolved shots featuring the faces of the prisoners yammering. As their beast-like noises (a symbolic allusion back to Graham’s remark about the guards “locking up the animals” inside their cells) become amplified on the soundtrack, Runch is seen with the shadow of a cross across his left eye on the right side of the frame. Not only does this expressionistic use of shadow suggest Runch’s impending death, it also suggests his blindness to how and when it will occur. In an imposing physical performance, which many have cited as an influence on his subsequent portrayal of “The Monster” in Frankenstein (James Whale, 1931), Karloff’s Galloway creeps through the door and prepares to stab Runch, who turns around to find Galloway behind him (6). In this continuous single shot, lasting a little over a minute, Hawks’ camera tracks slowly behind Galloway as he forces Runch behind a closed door and murders him offscreen. Hawks’ use of a continuous shot and expressionistic cross imagery anticipates the offscreen murder of mobster Louis Costillo (Harry J. Vejar) in the director’s subsequent Scarface (1932), which was released to great controversy the following year. This scene from The Criminal Code was later honoured by director Peter Bogdanovich in his Charles Whitman-inspired thriller Targets (1968). In an amusing example of postmodern intertextuality, former horror star Byron Orlok (Karloff) comments on how the perception of horror has changed in 1960s’ “The Times They Are A-Changin’” American culture, after having re-watched Runch’s murder from Hawks’ film on late-night television. Karloff may be called Orlok, but Bogdanovich intentionally aligns the actor’s real-life film persona with that of his character in the film. Despite Orlok’s lamentation, Hawks’ visual storytelling is still held in utmost regard. “He really knows how to tell a story”, Orlok’s screenwriter friend Sammy Michaels (Bogdanovich himself) remarks of Hawks. “Indeed, he does”, Orlok agrees (7). Well put. Andrew Sarris, You Ain’t Heard Nothin’ Yet: The American Talking Film, History and Memory, 1927-1949, Oxford University Press, New York, 1998, p. 268. Robin Wood, Howard Hawks, British Film Institute, London, 1981. Gerald Mast, Howard Hawks, Storyteller, Oxford University Press, New York, 1982, p. 354; Donald C. Willis, The Films of Howard Hawks, Scarecrow Press, Metuchen, 1975, pp. 152-153. Todd McCarthy, Howard Hawks: The Grey Fox of Hollywood, Grove Press, New York, 1997, p. 118. Karloff had co-starred as Galloway for seven months in a West Coast production of Flavin’s play before making the film version. Tony Williams, “The Criminal Code (1929),” Video Versions: Film Adaptations of Plays on Video, ed. Thomas L. Erskine and James M. Welsh with John C. Tibbetts and Tony Williams, Greenwood Press, Westport, 2000, p. 71. Adding to the postmodern intertextuality of this scene, Bogdanovich’s camera pans left from a television screen showing the image of a clock striking 2:08 in The Criminal Code to a clock on Orlok’s dresser showing the exact same time. In addition, according to Bogdanovich in his audio commentary for Paramount’s Region 1 DVD of Targets, his character’s (named after Samuel Michael Fuller) remark about having seen the film at the Museum of Modern Art in New York was, in fact, true of Bogdanovich as well. Bogdanovich had arranged a screening of the film as part of the “Cinema of Howard Hawks” retrospective (running from 31 May to 1 September 1962) that he organised.